This month, we were very happy to be working again with our friends at the SHARE Foundation to host our second litigation retreat. 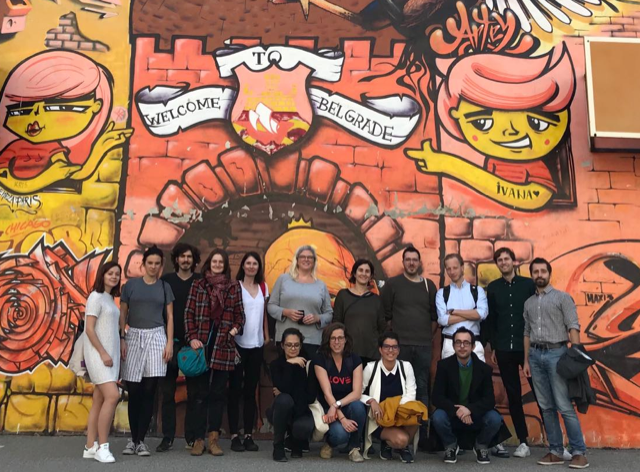 On this occasion the retreat brought together twelve digital rights litigators from across Europe in bustling Belgrade, Serbia to share and further develop their strategic litigation skills. At the retreat, representatives from nine organisations that work on defending rights and freedoms in the digital space came together: Access Now, Amnesty International, Digital Security Lab Ukraine, Human Rights Monitoring Institute, Irish Council for Civil Liberties, noyb, Open Rights Group, Privacy International, and the Public Interest Litigation Project. Each of these organisations also share an interest in using litigation as a means to ensure changes in law, policy or practice to enhance the protection of rights and freedoms in the digital sphere. The retreat was an opportunity for litigators to get away from the office and focus the mind on litigation work in a collaborative environment. All participants came to the retreat with a case that they were working on, and that they could strategise and plan around. The cases workshopped during the retreat dealt with a range of digital rights issues: from website blocking and surveillance, to challenging data retention regimes and securing enforcement of the General Data Protection Regulation. Alongside the workshopping of specific cases, the four-day retreat involved a mixture of group work, plenary discussion, and substantive knowledge sharing sessions dealing with a range issues from case management and campaigning around a case, to building and implementing a litigation strategy. We also had an opportunity to hear from Senior Advisor to the UN Special Rapporteur on Extreme Poverty and Human Rights, Christiaan van Veen, who discussed the potential role of the UN Special Mechanisms in maximising impact in strategic cases and the work some UN mandates are currently doing on digital rights. The litigation retreats form part of DFF’s work in supporting skill-building and skill-sharing amongst the field. This work will continue into 2019, with DFF supporting two thematically focussed litigation meetings. A call for applications for the first of these meetings, which will take place around May and focus on litigation around the GDPR, can be found on our website (deadline 30 November 2018). We are also working on a project to develop strategic litigation toolkits, which will include materials developed during the litigation retreats. We hope to share more information about this in the not-too-distant future! Next post Next post: Future-proofing our digital rights through strategic litigation: how can we win?